Decorated cupcakes are easy party snacks. Instead of laying out a large buffet or serving a full meal, plan to have a large variety of Halloween party snacks on hand for your guests. At parties where you want guests to mingle, dance, or play games, eating heavy meals can get to be troublesome. Save time and money by creating simple snacks for guests to nosh on throughout the evening. 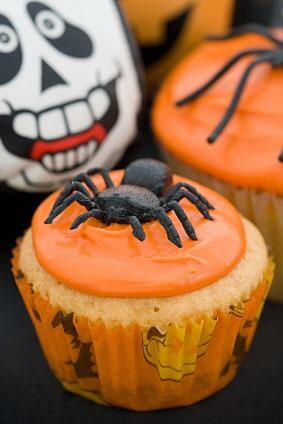 Make some frighteningly delicious treats that have a Halloween twist. Cut-out sugar cookies in the shape of bats, witches, brooms, and cats are perfect; fully decorated cakes are a hit as well. Graveyard Pudding: Mix together crushed chocolate sandwich cookies and melted butter, and press into a 9 by 13 pan. In a separate bowl, mix chocolate pudding according to directions. Add one package of cream cheese and several spoonfuls of whipped cream. Blend well. Pour over crust. Top with more crushed sandwich cookies. 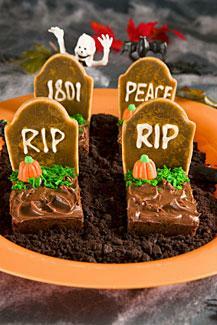 Use crackers as tombstones, sticking halfway up, and add gummy worms and gummy spiders across the top. Witch Hats: Using a spot of melted caramel, attach a Hershey's Kiss to the bottom of a fudge covered cookie. Pumpkin Cupcakes: Make cupcakes according to box directions. Top with white frosting tinted orange. Use chocolate chips to make eyes and pipe a crooked smile on using decorator's gel. Attach a green Mike 'n' Ike to the top for the stem. Ghost Cereal Bars: Mix together a batch of your favorite rice cereal marshmallow bars. Spread them in a large jelly roll pan. Use a ghost shaped cookie cutter to cut pieces. Warm white frosting until liquid smooth and pour over bars. When frosting has set, add M&Ms for the eyes and mouth. Not every treat has to be homemade. Local bakeries may have specialty items offered during the fall season using apples, pears, pumpkins. Pick up decorated cupcakes at the supermarket bakery to save some time. You also want to have a few bowls of candy corn or Halloween M&Ms mixed with nuts for guests to munch upon. With the amount of candy and cookies available at Halloween, you may want to offer your guests something on the lighter side. Holiday snacks can be festive and healthy if you get a little creative. Make a large batch of tomato soup and put into a cauldron for serving. Instead of using bowls and spoons, use Halloween decorated glasses so that guests can "drink" the blood. Make portions small and manageable, approximately ¼ to ½ cup. Arrange a vegetable and dip tray into the design of a goblin face. Using a large platter, arrange cauliflower as the eyes, orange carrots as the nose, and red radishes and peppers as the mouth. Make a low fat dip by mixing fat free ranch dressing with low fat sour cream, and tint it green. Spread it across the tray. Make warts using black and green olives on top of the dip. Mix a lime gelatin with marshmallows, pineapple, cherries, mandarin oranges, and bananas. Stir together and put into an angel food cake pan. Wait until the gelatin has set, then take out of the pan. Cut the angel food cake into about five layers, and then slice in half. Arrange the semi-circles into the shape of intestines. Remember to have a large batch of punch on hand. Place dry ice around the outside of the punch bowl to get a smoky cauldron effect. Note that dry is not for consumption and so should not be placed inside the beverage bowl. A Halloween party is a great reason to get together with friends, family, and neighbors. Keep portions small so that guests can socialize without being seated at a table. By offering a wide selection of healthy and sweet treats alongside traditional party favorites, you will be sure to please everyone's palate.